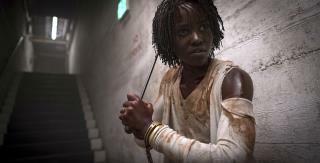 (Newser) – Jordan Peele has done it again. Two years after the filmmaker's Get Out became a box-office sensation, his frightening follow-up, Us, debuted with $70.3 million in ticket sales, according to estimates Sunday. Us took over the top spot at the box office from Captain Marvel, which had reigned for two weeks; Only Captain Marvel has notched a bigger opening this year, notes Variety, with $153 million. The Marvel Studios superhero release slid to second place with $35 million in its third week. But all eyes were on Peele in anticipation of his sophomore effort. In today's franchise-driven movie world, seldom has a young director been such a draw for moviegoers. Us also unseated A Quiet Place as the horror movie with the biggest opening. Peele is also breaking his own marks: Get Out opened with $33.4 million domestically before grossing $255.4 million on a $4.5 million budget. Us cost $20 million to make, meaning it's already a huge hit for Peele and Universal Pictures. Can't wait for it to hit Redbox. I quit going to theaters after Les Miseable with Russell Crowe and like Crowe but I don't like looking down someone's throat with the color spectrum in shades of gray and dirt. It was horrible. And Crowe thinks he can actually sing. Nope. Redbox or Amason or Ebay if it looks ok. Rarely go over $2. Its sad because it was one thing my son enjoyed when he was younger. Saw the movie last night. Brilliant. Lupita was a shining star. Scary AF! !